Eric got to see this crew perform at Middle of the Map Festival and told me we couldn't miss them at Boulevardia. The Phantastics played the Chipotle Home Grown Stage and the whole open area was packed. Folks were dancing, singing along, and overall just having a jubilee of a good time. That's what I like to see at festivals: participation. And it's especially cool so see people engaging with a local outfit. The Phantastics had lights, a smoke show (though at times I couldn't tell what was smoke and what was coming from vape pens), and a brass section that slayed. Their website describes them as "ambassadors of phunk, rap, rock, and soul creating intelligent dance music." Please keep representing. I've long been a fan of SLAPS (Squeal Like a Pig) BBQ out of KCK. They started as a competition BBQ team and are open for lunch "until they sell out." That's like saying an NBA draft prospect is a versatile defender and can shoot the 3. Pretty much, SLAPS BBQ is to Kansas City BBQ what Frank Ntilikina is to the 2017 NBA draft. And I like Frank Ntilikina a lot. SLAPS BBQ operated a food truck at Boulevardia, and along with sandwiches and beans they offered a delectable special treat: a burnt end burrito. Here's the thing: combining burnt ends and burritos might seem like a flashy PR play - people make weird foods for fairs and festivals. One time I went to the North Carolina State Fair and they sold fried butter. And a lot of people ate it. But The Burnt End Burrito (it deserves all caps) wasn't a fad. It was a combination of two of the world's best natural resources: burnt ends and burritos. Thank you, SLAPS BBQ. 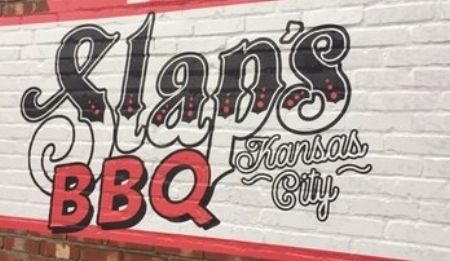 Also, if you haven't, check out KCPT's Flatland series about burnt ends. Boulevardia moved to The Stockyards District this year. According to the website, they made the switch because "Over the years the Stockyards District has seen its share of ups and downs, but it’s vibrant again and we’d want to host our party nowhere else." I hope they don't, because the layout, size, and aesthetic makes for a convenient and fun Kansas City culture. The historic buildings anchoring the venues, many now inhabited by artisans and artists, give a weight of meaning to this particular place. Shoutout, Stockyards Brewing! Even Kemper Arena - where I once saw the Harlem Globetrotters and attended a Christian youth group rally where a girl broke up with me - in the background made for a uniquely Kansas City festival experience. Also, that warm breeze and sunset was just a dream.